Surprisingly, many authors haven’t bothered worrying about book pirates. They figured a few copies going to readers who never would have paid for them anyway didn’t matter. Heck, some authors even thought book pirates could be good for their career. Spread the word, appeal to more readers who might buy their book next time, yadda yadda. Um, think again. When most of us think about book pirates, we think of a shady file-sharing pirate site. We wonder if the time we spend sending out DMCA takedown notices is worth it. We rationalize that no real readers go to those sites anyway, so the impact is small. Those are old-school pirates. Amateurs. The reality of book pirates is far scarier than we think. Welcome to a wild, lawless—and more importantly, consequence-free—mash-up of fan fiction, plagiarists, content scrapers, and Amazon scammers. Quite frankly, I don’t want to think about it because it’s enough to make me consider giving up. But maybe if more of us are aware of the reality, we can help each other, keep an eye open for suspicious activity, and push for change. I’ve written before about fan fiction (fanfic) and how some involved in the fandoms are ethically challenged. Unlike most fanfic writers, who create fanfic for love of the stories or characters, these people are interested only in the attention or in making a name for themselves. Some of the latest big name fanfic authors are, in fact, plagiarists. They copy from published books, change just enough (character names and worldbuilding terms) to match a fandom, and post the story to a fanfic site (like fanfiction.net). If they do any writing at all, they’re merely adding transitions between a section from plagiarized book A and a section from plagiarized book B. If they get enough acclaim—and don’t get caught—they might try publishing the stolen story for money, changing the character names yet again, in what’s known as pull-to-publish. The rise of Amazon self-publishing has led to scammers posting hundreds of books of dubious quality in an attempt to make money before Amazon catches up with them. Where do they get content for those hundreds of books? The internet. Content scrapers used to be mostly known for copying blog content and pasting it to their own site for the purposes of advertising and spam revenue. Google Authorship has made that route less successful. So they instead take that scraped content and make money by posting the material as non-fiction books on Amazon. Now, the scammers are also scraping fanfiction.net, FictionPress, literotica.com, etc. and taking those stories—some of which are already of questionable legality—and posting those as self-published novels on Amazon. Fanfic authors, who can’t even claim copyright infringement, are powerless to fight back. Or the scammers take a couple of those old-school pirate ebook copies, mash them together, and post it on Amazon—with their fake name as the author. Why just steal content like those old-school pirates when you can plagiarize it and make money off it too? We might want to pretend this couldn’t happen to us. Tell that to bestselling New Adult authors Jamie McGuire and Tammara Webber. A month ago, Jordin Williams was outed as a plagiarist for her debut novel. Except there was no Jordin Williams. Or Liz Thomas. Or Emily Curran. Or Beth Klein. Or Emma Buch. Or K A Andrews. All of these “authors” were in fact the same person: James Bishop, an Amazon scammer and content scraper. He created fake social media platforms on Twitter, Facebook, and Goodreads for each name. He stole pictures off the internet to use as their avatars. He scraped fanfic stories (calling it ghostwriting!) and posted them on Amazon for profit. He was caught when one of the fanfic stories he copied and published on Amazon turned out to be plagiarized from the two bestselling authors. Their many readers recognized the writing and reported the book to Amazon, who removed it from their site. In other words, he was caught only because he unknowingly copied a plagiarized fanfic instead of a normal fanfic, and the plagiarized content came from two bestselling books with many fans. Those of us who aren’t bestselling authors would have a harder time dealing with the issue but are no less likely to be victimized. Whether a published story is stolen for fanfic or for an Amazon scammer, the original author receives no benefit. Unlike the old-school pirates, who some argued “helped” authors connect with new readers, these stories are plagiarized. The original author’s name is no longer attached to the story, so there will be no new readers discovering their other work. Readers who would never download from a pirate site can unknowingly purchase a plagiarized story from a site they trust, Amazon, and the original author has limited ability to recover any damages or lost income. In addition, this “epidemic of plagiarism” is hitting the self-published arena harder because too many self-published books are plagiarized. The erotica section of Amazon is infected with them. Hmm, New Adult… Erotica… These scammers are going after the popular trends. That doesn’t help readers, reviewers, or book bloggers from knowing who among self-published authors are legitimate either, and that hurts all self-published authors. How Can We Combat These Pirates? It’s not good for our long-term career goals to hope our stories are never liked well enough to appeal to a fanfic plagiarist or a content scraper. *smile* That means we have to find ways to improve the situation. Register for copyright protection. In the U.S., all original writing is automatically covered by copyright, but we can’t sue for damages unless the work is registered. Set up Google Alerts for phrases from our books. I’ve recommended using Google Alerts to protect our blogs from content scrapers, and we should do the same for our books. Use Amazon’s Look Inside sample to do a Google search before purchasing. If you find a match on a free fiction site, the story might be plagiarized—either by a content scraper stealing the material from the fiction site, or by the poster at the fiction site stealing from the original author. Let authors know when you suspect their work has been plagiarized. Many eyes working together is better than using just our own. If even a blurb on Amazon sounds too familiar, let the author know. Sites like Dear Author are experienced at confirming plagiarism and spreading the word to get Amazon to take action. Report confirmed plagiarized work to Amazon. Encourage them to remove the work from sale. With enough pressure, they’ll issue refunds to purchasers. If they have to refund enough money, they’ll take the lead in preventing these spammers from posting stolen content. Traditionally published authors can encourage their publishers to push Amazon. Maybe Amazon will make changes that will benefit all authors (like stronger prevention and content verification, establishing consequences, etc. ), not just those who catch the scammers. Accept that Amazon may have to make pay-out changes. Amazon might have to institute a longer payment hold to create a cushion in ensuring the scammers never receive the money. Fanfic fandoms need to make it clear that plagiarism is unacceptable. Those active in fandoms can push fanfic sites to have a clear plagiarism policy and methods for reporting and removing violations and the violators. Recognize that our online presence is now more important. In the above cases, the “authors” weren’t active in the writing community—blogging or social media—until right before their debut releases. This is now a red flag and book bloggers are (rightly) becoming suspicious of review and blog tours requests from authors who don’t have a long-term online presence. That last tip, “be real,” along with our online presence, ensures that we won’t be suspected of being one of these content scrapers. Also, if people form a relationship with us, they’ll be more likely to report suspicious content that might be plagiarized from us. As I mentioned earlier this year, “the internet is not just a faceless mass of words. The internet is people. People like you and me.” And together we can improve this situation. Had you heard about the Jordin Williams plagiarism case? Had you heard the full story, with fanfic and multiple persona details? Do you have other suggestions on how we can improve the situation? How else could Amazon or other retailers prevent these scammers or create consequences for them? Self-Publishing? What’s Your Pricing Plan? But it finally clicked for me yesterday how all of these pieces are now working together now when I was reading up on the aftermath of the Jordin Williams case. 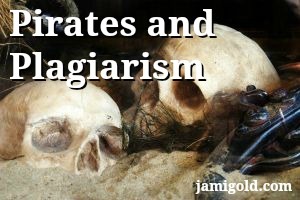 That “epidemic of plagiarism” article I linked to is excellent and gives other examples (meaning this wasn’t just a one-time thing). Worse, it won’t improve until Amazon finds better ways to deal with this. Thanks for the comment! I am so glad that Renee Schuls-Jacobson told me I should look you up. Your tips and pointers are a huge help to me and my peace of mind. Sadly, I had heard about the whole Jordin Williams debacle. A few of my review blogger buddies were really hurt when they found out they’d been used. I actually had that person listed on my TBR list on Goodreads. Obviously, I removed it immediately. The whole thing is both sad and shameful. Thanks for sharing tools to help defend against these shady people. Yes, I can’t remember which of the personas it was, but I’d unknowingly friended one of them in Goodreads. It’s odd and sad that something like this gives us a new, important reason to be active in social media. *sigh* Thanks for the comment! So what has changed is simply the scope, scale, and accessibility of the problem. As you said, the infoproducts market has its own vendors, markets, and social circle. That is, those products aren’t exposed and being sold to mainstream consumers. That’s where Amazon’s huge customer base makes this a slightly different issue. I’ve seen estimates that fifty percent of the titles in Amazon’s Erotica section are plagiarized. If true (and I know nothing about Erotica, so I have no idea 🙂 ), that’s a huge influx into the mainstream buyers’ market. Again, the Amazon angle gives this a bigger scope, scale, and accessibility as far as the mainstream market, who barely pays attention to self-pub vs. trad pub, much less being aware of any plagiarism concerns. That said, I completely agree that we don’t want to fret over this to the point of not writing. And your tip to focus on expanding our reader base so any plagiarism will be more likely to be spotted is excellent! 🙂 Thanks for the comment and adding the great tip! I actually saw part of that whole deal go down on Twitter – Ben LeRoy, publisher of Tyrus Books, blogged about it, Dear Author posted whole pages (complete with highlights) of the sections lifted…it was pretty interesting, especially the reaction from the NA bloggers who supported the book in the first place. Yes, the full details played out over several days. At first everyone just thought “plagiarist.” Then “Jordin Williams” claimed “she’d” been scammed by a ghostwriter. :O Since her bio said that she was an experienced ghostwriter and that her debut was her first book that she got to put her name on, that was mighty suspicious. Bloggers and Goodreads members worked together to put the bigger story of fanfic, multiple personas, and content scraping into context. I say kudos to them all–and it just reiterates that anything we do on the internet will eventually be found out. There is no permanence to “getting away with something.” 🙂 Thanks for the comment! I had, just recently, heard of this. It is astounding to me that someone would take the time to do something like this– and yet it doesn’t. There are bottom feeders in all walks of life and in all industries. I had heard one story of a “fan” taking something free an author had posted and packaging it for sale on Amazon. Beyond skanky. I honestly don’t know how to protect yourself, except never use free sites, or post your work for free on your own site. And yes, register your copyright. Keep backup copies of your work, so you can show a digital paper trail. I know Amazon does occasionally check for duplicated material, as some authors have received emails questioning issues (a free chapter on their site flagged the full book, and a UK listing flagged the U.S. listing). But I don’t know how extensive those checks are. The password-protect thing is actually to be able to claim that “first rights” are still available. Otherwise, you’re technically trying to license reprint rights when you shop your story around, and a lot of folks don’t want that. I guess my overall recommendation would be to use those sites to post maybe a chapter or so to find compatible critique partners/beta readers (which could then move to email), but not to post our whole story for review/editing that way unless we trust everyone who has access. I haven’t used sites like that, however, so I’m not an expert by any means. 🙂 Feel free to chime in if you have other thoughts. Thanks for the comment! Great post and suggestions about how to handle a frustrating issue that doesn’t seem to have an easy fix. I watched the latest one unfold on twitter and then got lost in some of the trad vs self-pub comments that emerged. Sigh. I don’t blame reviewers for being wary (esp given the above stat of 50%–eek!). But, still. Self-pub is a legitimate way to publish original work. Anyway, I appreciate your advice about staying active on social media–yet another reason to have an established platform. 🙂 Bless those readers who find and report instances of plagiarism. The numbers of books produced by traditionally published authors is decreasing, and there’s no guarantee that those are the “best” books anymore. Reviewers who refuse all self-published books will lose out on the opportunity to discover stars-in-the-making, which would be a shame. Perhaps writer organizations that give an extra sense of vetting will help their self-published members be accepted for reviewing in the future. For example, many of the instructors of WANA have met each other in person, so we know we’re real. LOL! Thanks for the comment! Also, wow, I didn’t think of the problem with having a fancy pen name. I wasn’t going to have one yet, because I still want to see my real name out there, lol, but thanks for pointing out this problem just in case I do want to use a pen name in the future. Yes, unfortunately, some people are cretins. As I mentioned in the post, in the U.S. all original work is automatically copyrighted–and we can use DMCA take-down notices, etc. However, I’ve heard from multiple lawyer-ly sources that court cases for damages want the paper trail of official registration with the copyright office. What raises a red flag for me are fake personas, when people pretend to be a completely different person–different personalities, likes, dislikes, hobbies, day jobs, family life, etc. At that point, there’s nothing real. Personally, someone who treats their career as an “act” doesn’t inspire me to trust them. Who would I be trusting? The fake persona that doesn’t exist? Or the person behind the persona that I know nothing about? Um, I’ll say neither. I hope that makes sense. 🙂 Thanks for the comment! Yes, back when a did a post about Google-ability, one of my commenters had a very common name and would never have shown up in a Google search without tweaking something. 🙂 Thanks for the comment! I’m happy to help. 🙂 Thanks for the comment! I suppose the time it takes depends on how “good” of a story the plagiarist wants to make. 🙂 For the ones who manage to make a coherent story, I absolutely agree with you. It takes storytelling skills and a knowledge of structure and characterization to create coherent story flows and character motivations, etc. They’d be much better off using those skills on original fiction. Oh yes, I vaguely remember hearing about that case too. As you said, unfortunately, in their mind their shame is in getting caught, so they change merely their methods of cheating, not their cheating approach. Personally, I’ve seen Terrell Mims get caught twice for that very reason. *sigh* Thanks for the comment! I just ‘discovered’ your site due to this post being shared on FaceBook. I have to admit that I was shocked by the whole, Jordin Williams episode, when I first heard about it. I’d heard of pirating and plagiarizing many times before, but didn’t realize how big it had become. One thing I do think is good about the present writing world, is that authors are accessible to their readers/fans thanks to the Internet. A lot of them have developed an online relationship with their readers via FaceBook, Twitter and blogs and, when something like this happens, loyal followers are better able to notify authors immediately. Mailing a fan letter to an author was such a waste in the ‘good old days’. If you received a response at all, most of the time it was a form letter and so impersonal. These days, you can post something on an author’s FB page, or leave a comment on their blog, and they’ll comment back to you. You can even carry on whole conversations with someone you otherwise wouldn’t have any access to. I think this will help a lot in taking out these pirates, as well. There’s nothing like a loyal fan, especially one who feels like a personal friend, to watch your back for you. I agree with you completely about the accessibility and engagement with others being a factor in our favor. As you said, that allows for easier notification of authors when fans discover issues as well as providing a personal touch that leads fans to care. In the “Jordin” case, I’ve heard the personas were somewhat active on Goodreads, in that they all belonged to the same group, promo’ing for each other. Not quite the same. 🙂 Thanks for stopping by and for the comment! And kudos to Jay for blocking the attempt to copy your site–it’s great to know he’s part of your team, isn’t it? That’s all just part of my point about us looking out for each other. 🙂 Thanks for the comment! I’m glad the problem was fixed. I would just like to add two points. First, obtaining a Registration on your work from the Copyright Office not only gives you the right to sue the offender/pirate/plagarist, it gives your lawyer the opportunity to recover attorneys’ fees (an incentive). The Registration must be obtained before the infringement takes place. My recommendation is to file the application for copyright on your work before publishing. Second, Amazon’s KDP contract states (in section 5.7), that if a third party (“pirate”) makes sales of your infringed material then you are entitled to be paid the Royalties due for those sales and Amazon will take the book down. Along with all the other jobs of a self-published author comes the job of policeman. You must protect your work. Yes, I’ve heard that’s what Amazon’s contract states. However, I’ve also heard it’s not that clear cut when it comes to actual situations. First, if Amazon has already paid the plagiarist, they’ve stated that the author has to go after the plagiarist for the money. Not sure how that meshes with their contract or if this is a case of the right hand not knowing what the left hand promised, but I know that’s been their answer to some of the authors this has happened to. Second, if they haven’t paid out the money to the plagiarist yet, they’ll often just refund the customer, so there wouldn’t be a sale to pay royalties on. In other words, I’d be interested in hearing more about how that clause works in real life. 🙂 Thanks for the comment! Hey Jami! Great post! Some authors make it even easier for the crooks by putting their entire books online as blog posts! Talk about giving your book away for free! Luckily I was fortunate to stumble across your blog and Kristen Lamb’s also. You guys have really helped with my learning curve when it comes to the business side of writing. Great point about the dangers of putting our entire book online. Also, as was mentioned in the comments above, that means the author can no longer sell first publishing rights. Thanks for the comment! I have written two books, several poems, etc. that I published myself. They were included in an anthology, printed in a Dallas journal, read on KETR, a university radio station. Since I am an avid reader, I just happened to read an article in “Texas Coop Power” which was based on my book; the writing style was obviously copied and words were lifted in sequence from beginning to end of my book. I recently read a book that included, “I hung my head” threetimes (song by Sting), for no reason it through in a reference to a “Swiss army knife” which was an image used repeatedly in a Mark Haddon book, and there was a description of his father which was written in the same style as in my poem which had been published in an anthology. Coincidences? Why are book publishers not using the same anti-plagarism methods as colleges and universities. It is certainly unfair to those of us who write because once our ideas are stolen then our voice has been stolen from us by writers who are already successful. Have they just gotten lazy or is that the secret to their success? I’m so sorry that happened to you. Like you, I wish Amazon and the publishers did a better job of vetting stories against plagiarism. 🙁 Thanks for stopping by! Yikes! I’m sorry that happened to you. Thanks for the inside scoop from the fanfic side of the situation, and thanks for stopping by! You’re welcome. I learned a lesson, all right. It just wasn’t the lesson they thought they were teaching me. I’m writing original fiction now. Thank you for exposing the shady side of that too.